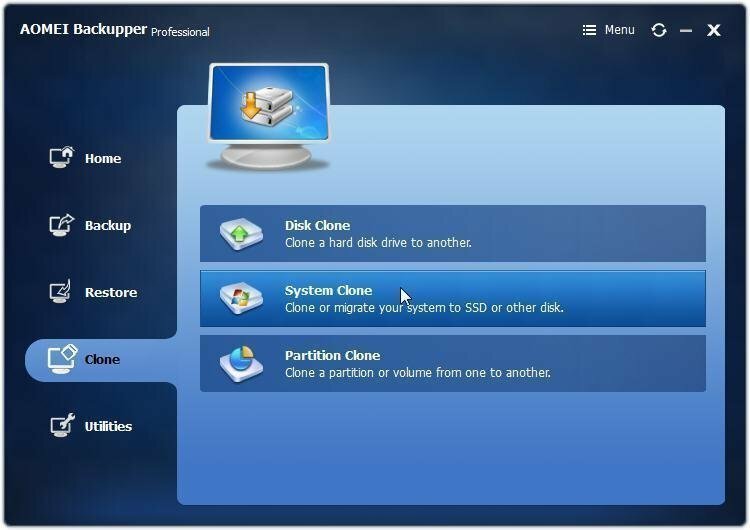 How to Clone Windows 7 System to another HDD or SSD? You can clone system partition in Windows 7 to another larger HDD for more disk space or a new SSD for better perfromance. 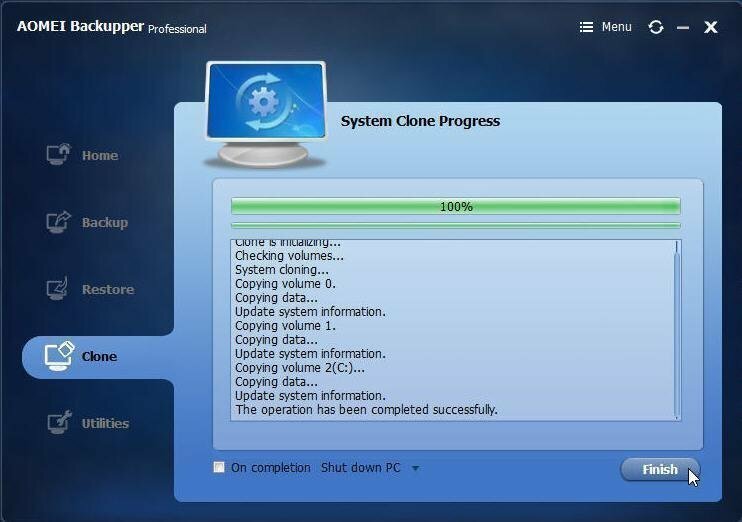 Windows 7 free clone software - AOMEI Backupper is your best choice. Why do you need to clone system for Windows 7? Windows 7 operating system is acclaimed by computer users. However, it still has many problems that we should clone system to solve. Computer’s hard disk drive (HDD) will store more and more programs and data so that it will perform slower and slower as time goes by. If you want to optimize its performance, you can try to change a new HDD to replace the old one. Clone Windows 7 system to the new HDD can save a lot time to reinstall the system. Clone system for Windows 7 can prevent the disk broken effectively. Clone system can save all the data of system so that it won’t make a big damage for you. If you want to use the SSD to replace the HDD with the same operating system to optimize the computer’s running speed, you can migrate OS from HDD to SSD with cloning system. In a word, cloning system for Windows 7 brings a lot of benefits for users who want to protect system, upgrade system or change HDD. How do you clone Windows 7 system? Windows 7 snap-in tool doesn’t provide a function for users to clone system. Well then, how to clone Windows 7 system? It’s no doubt that you should find a third-party software to clone windows 7 system. Here, perfect solution of AOMEI Backupper Pro will be highly recommended to all users. It supports to clone Windows 7 system disk to other hard drives, which makes your computer run as the previous way quickly without reinstalling operating system and application programs. Besides, you can use it to backup system, restore system, create bootable media, synchronize files with real time, etc. AOMEI Backupper is designed with an intuitive interface for all windows users. It just takes a few clicks to clone Windows 7 system to another SSD or HDD and the followings are the specific steps for you to reference. Step1.Launch AOMEI Backupper Pro edition and active with license code, then select “System Clone” under the Clone tab. 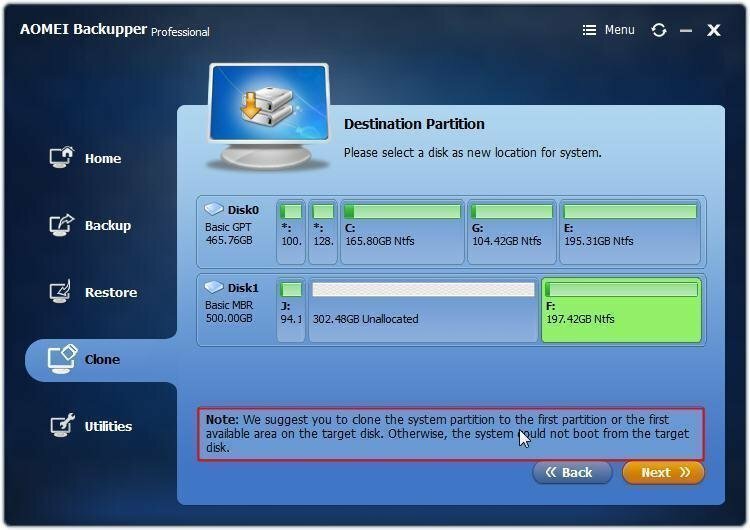 Step2.It will lead you to choose the destination partition as a new location for system since the program will select the source system partition automatically. You can choose the other local space, or the external hard drive you prepared before. The destination must have enough volume to store the system files. Click Next to continue. Note: Supposing you don’t choose the first partition or area as the destination partition, you will get a notice of cloning the system partition to the first partition or the first available area on the target disk if there are more than one partition or area on your destination disk. It's to prevent your computer from unbootable. Step3.You will be lead to the operation summary interface and confirm all the information including source partition, destination partition, file system and used space size. Please click to perform the system clone if there is no problem. Tips: There are two useful features available here. Sector by sector Clone will copy all sectors from the source disk to the destination disk whether it’s used or not. It takes longer time and the destination disk must be at least as large as the source disk if ticking sector by sector clone feature. Align partition to optimize for SSD feature is particularly useful for those whose destination disk is SSD, which would enhance SSDs reading and writing speed. Step4.When the system clone progress has reached 100%, click Finish. You can still use the AOMEI Backupper Standard to create a Windows 7 system image and restore it to a new HHD, which could achieve free clone system yet with more steps needed.